WASHINGTON The United States and Germany on Friday warned Russia not to endanger a planned peace conference for Syria or alter the balance of power in the Middle East by providing an advanced air defense system to President Bashar Assad's embattled regime. 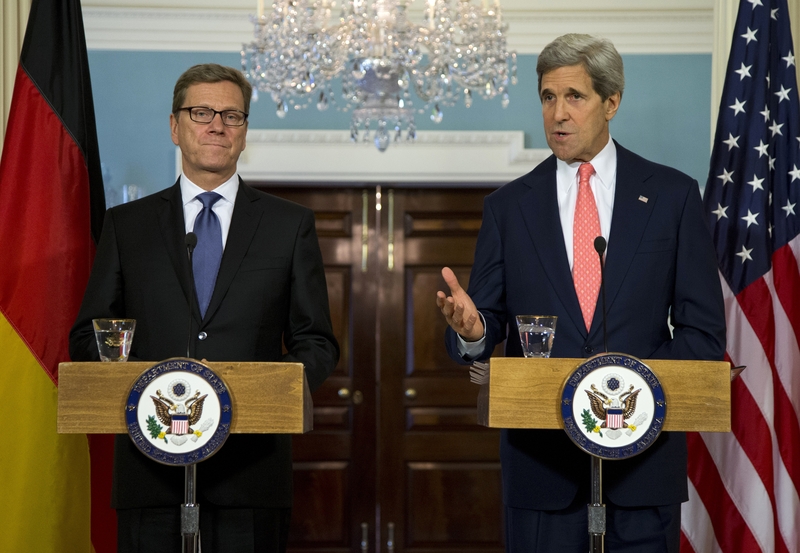 Secretary of State John Kerry and German Foreign Minister Guido Westerwelle said the transfer of S-300 missile from Russia to Syria would prolong the country's civil war, imperil attempts to form a transitional government through negotiation and hurt Israel's strategic interests. "It is not helpful to have the S-300 transferred to the region while we are trying to organize this peace (conference) and create peace," Kerry told reporters at a joint news conference with Westerwelle after they met at the State Department. "We ask them again not to upset the balance within the region with respect to Israel," he said. "The weaponry that is being provided Assad whether it is an old contract or not, has a profoundly negative impact on the balance of interests and the stability of the region and it does put Israel at risk. It is not in our judgment responsible because of the size of the weapons, the nature of the weapons and what it does to the region in terms of Israel's security, so we hope that they will refrain from that in the interests of making this peace conference work." Westerwelle called on Russia not to "spoil" the conference, which was planned for Geneva next month but has been delayed until July at the earliest. "Don't endanger the peace conference in Geneva," he said. "The delivery of weapons to the Assad regime is totally wrong ... It is the wrong message which has been sent by our colleagues in Russia to the world and to the region by delivering S-300s or other parts of weapons." Kerry and Westerwelle spoke a day after Assad suggested that his regime received a first shipment of the state-of-the-art anti-aircraft system, which would reduce pressure on it to negotiate with the opposition, make foreign intervention more difficult and alarm Israel. The United States has made Israel's qualitative military edge one of its prime strategic interests in the region. Russian officials have said they will supply the S-300s to Syria under an existing contract. They have also said that they will try to convince the Assad regime to participate in the Geneva peace talks. But the Syrian opposition has said it will not attend the conference while massacres are continuing. Kerry said he believed the opposition would attend the meeting once it straightens out questions about its leadership. He also warned anew that the use of chemical weapons is a "red line" for the Obama administration. At the same time, he said intelligence and evidence that such weapons have, in fact, been used, is still being vetted for 100-percent certainty. "We are doing our due diligence, as we should do given past experience, to make certain that the intelligence is correct, that the evidence is real and then make judgments that are appropriate," Kerry said. CBS News correspondent Margaret Brennan reported Wednesday that U.S. Ambassador Robert Ford, one of the men trying to get both sides to the table at upcoming peace talks, will be stepping down from his post this summer.